The Come Home Love: Lo and Behold <愛·回家之開心速遞> cast attended a banquet to celebrate their success in ratings for their drama and surpassing 1,129 episodes. 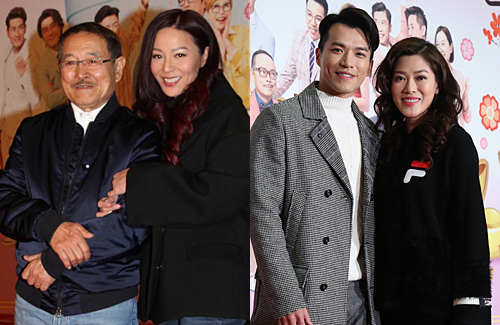 Over 50 cast members attended including Lau Dan (劉丹), Koni Lui (呂慧儀), Joyce Tang (滕麗名), Mandy Lam (林淑敏), and Jack Hui (許家傑). As few TVB executives including Catherine Tsang (曾勵珍), and Virginia Lok (樂易玲) were there as well. Lau Dan has enjoyed filming Come Home Love since the beginning. He hopes that the show will continue for a long time and break the record established by A Kindred Spirit <真情>, which ended with 1128 episodes. Catherine Tsang shared that Come Home Love will likely surpass A Kindred Spirit in length, as they already approved filming through the 720th episode. Joyce knows that she will at least film till December, while Koni hopes to film till 2020. I finally watched the episodes with Jack in it. They are a funny couple. Althought Ctone home love isn’t very realistic it’s entertaining enough. Hope Mandy and Jack have a good ending in the series!